The EUSO-SPB launch on April 24, 2017. 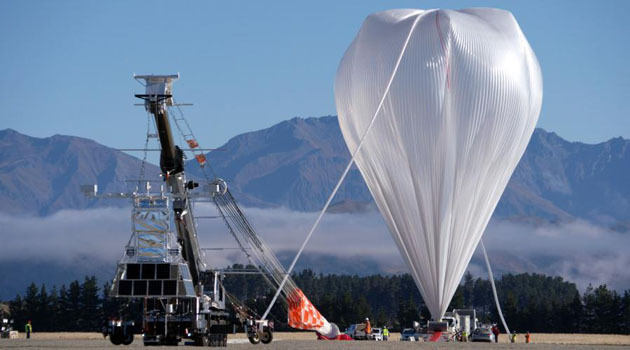 The Extreme Universe Space Observatory on a Super Pressure Balloon (EUSO-SPB) is a cosmic ray observation experiment, which emerged from the JEM-EUSO project. EUSO-SPB will be the first to observe fluorescence and Cherenkov photons from extensive air showers from above in near-space. A mysterious cosmic source sends matter particles to Earth from the far reaches of the Universe. These particles can be 10,000,000 times more energetic than the most energetic artificially produced particles, which are accelerated at the Large Hadron Collider, at CERN, in Geneva, Switzerland. We call them ultra-high energy cosmic rays (UHECRs) and they range in energy from above 1018 eV to 1020 eV. EUSO-SPB will be the first telescope to observe the fluorescence from UHECR tracks from above the atmosphere. It will observe the fluorescence track of a number of UHECR showers and may observe the backscattered Cherenkov radiation of these showers if the SPB flight is long enough. Space missions proposed to solve this longstanding mystery will be informed by the EUSO-SPB flight, these include: JEM-EUSO, OWL, and POEMMA.